Completion of the 700 K Street project continues. About half of the 137 dwelling units are now occupied. Retail including bars and restaurants on K Street will be opening throughout 2018. 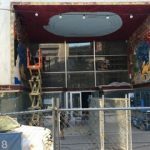 The restoration of the 1973 Frank Carson/Mitchell Aronson psychedelic mural at 726 K, which is being transformed into Solomon’s Delicatessen, is underway and is expected to be complete in July. See here for more on the mural.